legendary "Queen of Romani Song"
HERDELJEZI: the traditional Romani (Gypsy) spring holiday of renewal and fertility. The California Herdeljezi Festival draws attention to the ongoing struggles of Romani people around the world, strives to counter negative stereotypes, and supports efforts by Roma to rebuild and maintain their communities, improve their lives, and strengthen their international voice and visibility. Bulgarian/Balkan food by Hristo Kolev - available for purchase. Voice of Roma's 19th annual Herdeljezi Romani Music Festival is supported, in part, by grants from the National Endowment for the Arts, The Trust for Mutual Understanding, and the City of Oakland Cultural Funding Program. Esma Redzepova, vocals, Simeon Atanasov, accordion; Filip Nunevski, trumpet; Aleksandar Stamenkovski, guitar; Nikola Mitrovikj, bass; Safet Demirov, drums. Esma Redzepova is internationally acclaimed as the "Queen of Romani Song," and has been hailed by NPR as one of the world's "50 Great Voices." Born in Skopje, Republic of Macedonia, she began her professional career at the age of thirteen. She was the first Balkan performer to make Romani music popular with non-Romani audiences on elite concert stages in the early 1960s. Esma, who sings in over ten languages, earned the title "Queen of Romani Song" at the World Festival of Romani Music in India in 1976. 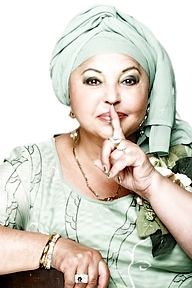 At the Festival of Roma Experiences in Moscow in 2000, she was proclaimed Laureate and Roma Singer of the Century. In 2013 she represented Macedonia in the Eurovision Song Contest. Esma has performed for many heads of state and has toured for more than four decades, giving more than 8,000 concerts in over 30 countries. Her appearance in Oakland marks the culmination of her U.S. tour, one which she insists will be her last overseas. In addition to her stage work, Esma is a world-renowned humanitarian. Over the past thirty years she has fostered 49 children, many of whom have become professional musicians like master accordionist and ensemble arranger Simeon Atanasov, who leads The Folk Masters Band. Esma has been a major contributor to countless advocacy and assistance programs for women and underserved populations, including the disabled and Romani refugees from Kosovo. She is honorary president of the Macedonian Red Cross, and has given more than one thousand benefit concerts. In 2000, the Sorority of Roma Women proclaimed Esma "Woman of the Millennium." In 2002 Esma was nominated as United Nations Ambassador for Refugees in Macedonia, and was nominated a second time for the Nobel Peace Prize. In 2010, she was awarded the Macedonian Order of Merit, and in 2013 she was proclaimed a National Artist of Macedonia. Voice of Roma is a California- and Kosovo-based NGO that promotes the rich cultural heritage of Roma dating back over a thousand years through festivals, workshops, performances and educational presentations. Voice of Roma also works to heighten awareness of human rights issues faced by Roma in today's world, and to support efforts by Roma to build and maintain their communities, and to improve their lives. Voice of Roma's president, Sani Rifati, is a Rom from Kosovo who immigrated to the United States in 1993, co-founding Voice of Roma three years later. Rifati has taught at many international dance camps and festivals. Festival Panelist and Voice of Roma Board Member Carol Silverman is an activist and scholar of Romani music in Eastern Europe. Her book Romani Routes: Cultural Politics and Balkan Music in Diaspora (2012) won the book prize from the Society for Ethnomusicology. "Herdeljezi" is the name for the Romani spring holiday of renewal and fertility. Just so, the Herdeljezi Festival seeks to renew interest and attention on the continued struggles of Romani people around the world, striving to counter negative Gypsy stereotypes and supporting efforts by Roma to rebuild and maintain their communities, improve their lives and strengthen their international voice and visibility. "Few Americans know that one million Roma reside in America today, that Roma are the largest minority in Europe today and that Roma have a rich and varied culture in spite of centuries of discrimination," says Silverman. "Furthermore, festivals of 'Gypsy Music' are often stereotypical fantasies geared toward exoticism. Voice of Roma's Herdeljezi Festival, on the other hand, places the music in its cultural and historical context." Kitka is an Oakland-based women's vocal arts ensemble and presenting and educational organization inspired by traditional songs and vocal techniques from Eastern Europe. Dedicated to developing new audiences for music rooted in Balkan, Slavic, and Caucasian women's vocal traditions, Kitka also strives to expand the boundaries of folk song as a living and evolving expressive art form. Voice of Roma is a 501(c)(3) tax exempt charitable corporation. You may deduct donations from your federally-taxable income.